Their daughter left public school in grade two. She’s now fifteen and, while she insists a high school diploma is necessary, she’s having trouble with distance learning courses. The question was about ways to help her see that her future doesn’t revolve around a diploma. Or do they let her experience the failure of not being able to achieve a diploma. If she’s up for it, I think connecting with other teen unschoolers might be really fun for her. She could see what other unschooling teens are up, what they are pursuing, and that might help her explore why she might be thinking that a high school diploma is essential. There are unschooling teen camps she may enjoy: Not Back to School Camp and East Tennessee Unschooled Summer Camp. They may not be close by to wherever you live, but we’ve traveled to the US lots of times to meet up with unschooling families at conferences and camps. My kids didn’t go these camps specifically, but I know of a number of unschooling teens who have enjoyed each of them. Share with her that these opportunities exist, and you guys can—either together or on your own—check out the information on the websites, join the mailing lists, check out feedback etc. Share what you learn and then give her space to contemplate. Even if she isn’t interested for now, she knows about them now, and may be interested next year, or the year after that. There are also a couple of companies that organize trips for unschooling teens and young adults. I’ve heard good things about both of them. Project World School is run by an unschooling mom and son, Lainie and Miro. (Lainie was on the podcast.) And there’s Unschool Adventures, run by Blake Boles. None of these are cheap, but they can definitely be life-changing. There’s time to enjoy the planning process and save up. On the podcast we often mention the value of time—these kinds of questions don’t need to be, and probably can’t be, answered immediately. We don’t learn much about ourselves if we stand in once place, squinting into the distance, trying to see our end goal and the path to get there before we decide to set out. IF we set out. You guys might want to try an unschooling conference—many of them try to cater to the teens as well, having a place for them to hang out and some teen-focused activities. There’s a conference list on the unschoolingmom2mom website. There are links to all the things I’ve mentioned in the show notes. They have been unschooling for about 3 years now, and their eldest is nine. They worry they are failing her in some way because over that time, she’s had a number of interests that lasted a few months and then fell by the wayside. Now she’s deeply interested in playing Roblox, and online game, and, while they see her learning a lot, they’re feeling very disconnected from her. The other concern is that when she does express an interest in something else, she doesn’t follow through. An example they gave was her saying she wants to make YouTube videos, so they bought her a camera, told her that when she was ready to ask if she needs any help, and the camera is still new and unused. There were a couple of things that jumped out at me as I read the email. The way you describe your oldest daughters’ Roblox play does seem disconnecting. It’s not about giving them access to the game and then leaving them alone to play. Do you watch them play? Do you play with them? You mentioned having some conversations—if this is something they really enjoy, have LOTS of conversations with them. What is it they love about the game? Make connections between the game and things in the world. Truly CELEBRATE their Roblox joy. Reflect their joy back to them. Also, from how you describe your actions when your daughter expresses an interest, I see that disconnection there too: you buy the tool/supplies she needs to “accomplish her goal” and then step back and wait for her to ask for help. The technical details of reaching a goal are a small part of the overall process; what she really needs is your ongoing, day-to-day connection and support as she explores the push and pull of pursuing an interest. So, for example, when she expressed an interest in making YouTube videos, you bought her a camera. And that’s great! But then you stepped back and waited. Her saying she isn’t ready yet is a clue that there’s lots more going on for her than just how to use the camera. Maybe have lots of conversations about what kinds of videos she’d like to make. Brainstorm episode topics, channel names, set design. Ask about why she’s not feeling ready quite yet. Curiously, not judgmentally. Is she nervous? About what specifically? Maybe offer up the idea of creating and uploading one short video to YouTube and keeping it private for her viewing only—just to see what it’s like. Offer to do most all the work for her for now, so she can focus on what to do on camera. Learn together how to do it. Many times I’ve helped my kids try out an interest by doing lots of the supporting work for them–if they wanted me to. We want to help them accomplish their goal! Learning is not about insisting they do it all themselves. If their interest continues, eventually they take over the various supporting tasks, one by one, until they’re doing it all themselves. Or, they move on to something else. Unschooling is very hands-on and focused on building connections, trust, and strong relationships with our children. It’s not just giving them the physical tools they need to pursue their interests and stepping back until they ask for help. It’s about learning together, alongside them: them learning about the topic and you learning more about why their interested and how you can help them pursue it. The other thing to consider is that maybe they really aren’t ready to take that next step. Think about yourself. Do you have things you’re interested in doing, yet you haven’t taken the next step toward actually doing it? I do! I’m not a failure because I haven’t followed through on these interests. What I am gaining is self-awareness. The realization that I have interests and dreams for which I’m not yet ready to put in the effort. They continue to incubate. To swirl in my subconscious. Maybe they’ll come to fruition some day. Maybe they’ll connect to a different project that will also accomplish whatever it is I’m seeking to satisfy—they may just be an internal stepping stone to something else I have yet to discover. It’s all okay. We learn so much about ourselves through the choices we make: whether those choices are to move ahead with something or to not. The cool thing is, with our connected and trusting relationships with our children, we have conversations about the things they’re thinking about. They share their thoughts with us. Often before they’ve fully chosen which direction to take. And that choice is often about taking a step toward it and seeing how it looks. How cool is the connection to the first question?? A question about connecting unschooling teens and a question about a nine-year-old seemingly not following through on her interests. Expressing an interest in creating YouTube videos was a step in that direction. Getting the camera was another step forward. Two steps on, she’s learned a little bit more about herself, looks around and has decided, for now, to step in another direction. We’ve also talked recently on the podcast about our own deschooling around the idea of “being productive.” Around the topic of our children’s interests, it can be helpful to ask ourselves if we’re expecting some kind of “output.” Some kind of “proof” of their learning. Do we notice we’re more apt to quickly respond to our children’s needs when there’s a measurable outcome in sight. There are just so many aspects to most seemingly simple questions! Because, through the lens of unschooling, we see how everything is connected. This family, with three children ages 1, 3, and 5, are just getting started with homeschooling as their eldest reaches school age. Both parents work fulltime but have flexible hours. They are keen to unschool but we are also contemplating enrolling our eldest in 2 or 3 after-school classes per week due to our work commitments. The idea would be free and easy mornings with Mom with some scheduled 2-3 hours classes/activities several times a week for the eldest. The kids would also be with a nanny whenever they are both at work. The question was, if this would negatively impact the kids’ natural learning tendencies and interfere with interested-based learning? And, having asked that, she wondered if this would still be called unschooling? Does the label matter? Regarding the after-school classes, I think the important thing is that your son is happy with the arrangements. It’s the choice that’s key. If they don’t have a choice, that can undermine your relationship and keep it based in power: the adult’s power to insist a child do something. With unschooling, we’re looking to develop different relationships with our children, steeped not in power but in connection and trust. So, the answer really is to look to your child. And have conversations with him. Would he like to go? And later on, is it working for him? If not, maybe brainstorm some other possibilities. Can he stay with the nanny too when you’re both working? You can explain to the nanny that your goal is for her or him to have fun with the kids. Or maybe there’s another kind of supervised activity at that time that he would enjoy. Either way, see yourself as your child’s partner. Rather than seeing your goal as having to convince him to follow your “after-school classes” plan, work together to find a plan you’re both excited about. If he like your idea about some after-school classes, that’s great! If not, there are other possibilities explore. New to the ideas of attachment parenting and unschooling, this mom and dad would really like to try to truly unschool for the next year, but they have reservations about unlimited screen time (they don’t have a TV, only recently getting smart phones and a tablet), less structured behavior systems (they do stickers for good behavior which earns them small prizes, and time outs for bad behavior), no defined bedtimes etc. Dad is also very concerned about the girls not getting more structured teaching about math and reading/writing as well. The concept of trusting their kids to learn for themselves is a foreign idea, but also a fascinating one. They like that unschooling is focused on relationships, but letting go of control is scary for them. I completely understand how the thought of releasing control is scary—you don’t yet have a good feel for what you’ll be replacing it with so all you can really imagine is a chaotic free-for-all. 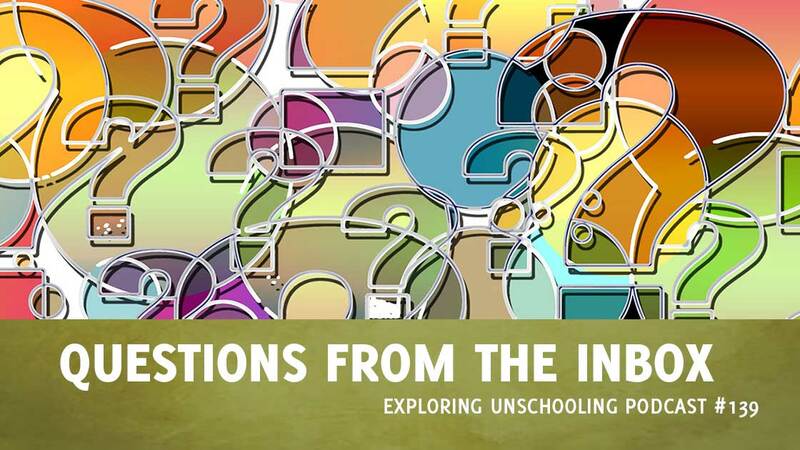 I remember when I was first reading online about unschooling, I read some of the ideas and think, “Well, we won’t be doing that.” But I kept reading. And then a few months later, as I learned more about unschooling and watched my kids in action, the principles behind those choices began to make sense and I began making those same choices. So, yes, I think step-by-step makes the most sense. You mentioned this deschooling period and it can take parents at least a year, often more, to work through the bulk of it. In my book, Free to Learn, I talk about the five most valuable paradigm shifts around learning and parenting that I made in that first year or so. And truthfully, deschooling doesn’t ends. Over the years, we continue to run into pockets of conventional beliefs that we haven’t yet examined to see if they make sense to us. Keep reading and listening and exploring and playing … and have fun! This mom reached out because her 14-year-old daughter (who mostly grew up in the school system) wasn’t feeling accomplished being homeschooled. She got made fun of, she wants a real graduation, and maybe wants time away from her little siblings (4,5,7). So, she chose to go back to school. Mom’s heart was SO heavy. Long story short, unsurprisingly to mom, school is taking over her daughter’s life. Mom explained that she had an IEP before because of her head injury, but this time she doesn’t want one. And her grades are going down. That’s meant more, harder work. Staying after school. Going in early. More practice. More more more of the things that she will never use later on in life. It makes her mom sad. She’s told her daughter that she’d find more things for her that she loves but it’s harder than she thought; everyone seems to require 16 years of age or so. She wants to know, what can she do to help her daughter, better ease her own mind, and maybe somehow bring daughter her back home? I hear your concerns, absolutely. Yet, as you say, this is her choice for now. You might find some helpful nuggets in podcast episode 32 with Alex Polikowsky, about her experience when her daughter chose to go to school. Help your daughter with school as much as she’d like. While at the same time, don’t get pulled into the whole ethos. You don’t need to care about grades or homework—be that example to her. If she cares about grades, ask her how she’d like you to help. Alex and I talk about that in the episode. And meanwhile, outside of school, do the fun stuff that brings her joy! Focus on those things. Surprise her with those things. Make her life as joyful as possible. As full of choices as possible. I remember that time when they’re looking to do more in the world and those age restrictions come into play. Particularly with my daughter Lissy—we talked about that quite a bit. One suggestion is not to take those restrictions as set in stone. Call and talk to them about it. Describe your particular situation—your child’s passion for the topic, their maturity, their excitement to be more deeply involved. Learn more about what they may need help with. Mention volunteering, or mentoring. If it’s a legal or safety issue, offer to go with your daughter and be the adult with her, taking responsibility for her safety. Some places will work with you, some won’t. But it’s always worth asking. Doing all we can think of—inside and outside the box—to help our children pursue their goals and desires, is the heart of unschooling. This question was a really interesting one about the contradictions the mom is seeing. She has 4-year-old son and an 18-month-old daughter. She’s been reading my books this past year and chatting with an unschooling friend. Her 4-year-old currently goes to Junior Kindergarten 3 mornings a week, and she’s been trying to bring unschooling principles into her parenting. But in doing so, she’s found she’s developed contradictions in the way she parents. One is, she wants to give her toddler freedom. How is this possible when they still need so much help, physically? And when they themselves don’t understand risk? For example: In the winter, the kids hate getting snowsuits on. Yet, she wants to make sure that they are dressed for the climate. If they go tobogganing without snowsuits, and they quickly get wet, and they are far from home—then she has two children melting down because they are cold. Is it possible to protect our children from known dangers in the unschooling paradigm, while allowing them to take risks? Another contradiction she sees: getting in the car seat to go places. Often, she lets her 18mo play around in the car until she’s happy to go in her car seat. Sometimes, depending on the circumstances, there isn’t time for that and she ends up forcing her upset toddler into the car seat. This is not giving her freedom. She wants to better understand unschooling so she can decide whether it’s something she truly wants to dive into—or let go of. She wants to be a better parent, and to do that, she wants to see the path more clearly. It was a great question! So let’s dive in. Instead of thinking about unschooling as giving our children freedom, it might help to think of it as giving them choices. So, the freedom to choose. That helps us realize there are lots of times when they aren’t interested in making a choice—they just want us to give them something to eat. Or get dressed. Another thing is, as you say, we have more experience with the world. While they want to explore the world and make choices like whether or not to wear a hat, that needn’t be a cut-and-dried question and yes/no answer. And often it shouldn’t be—there’s not much learning in that. We can add our experience to the discussion, like, “It’s really cold out. I think you might get uncomfortable without a hat.” If they still don’t want to put one on, we can bring one with us, because we anticipate that they may well change their mind once they’re out there. “I’ll put your hat in the bag to bring with us in case you change your mind.” If you’re outside and see their ears turning red, mention it, “Your ears are turning red, that means they’re getting cold. I’ll get your hat.” No need to even interrupt their play, just put the hat on them. If a certain hat is itchy or uncomfortable, take them hat shopping to find one that is comfortable. Or if they don’t like shopping, pick up a couple to bring home and try. Or check out a thrift store for some that are nicely worn in. Unschooling principles are not about giving them freedom to do whatever (like choose to not wear a hat) and then leaving them alone to experience/suffer the consequences until they’re back home. We want to live with them, to help them re-visit their choices as new information comes along (like, feeling cold or wet, or red ears, or white fingers etc). Again, we’re more experienced so sometimes we can anticipate the way things may play out and be prepared, like having a change of clothes if we think they’re going to get wet; coats, snowsuits, hats and mitts if we think they might get cold; snacks for hunger; toys for something else to do etc. It means that if they get uncomfortable, or we notice a clue and share our observation, we have just the thing to solve the problem in the moment. Over time, they come to trust us more deeply, learning that we are pretty good at anticipating their needs and things that may go awry. And, as many unschooling parents have discovered, they get really good at recognizing and anticipating our needs as well. As for the car seat example, in the toddler years, it’s not really about unschooling at all, but parenting choices. As with attachment parenting, it’s about your relationship with your child. Ending up in a situation where your only option is to insist your child get in their car seat is not an “unschooling failure.” Sometimes we end up in situations with other people where we have no other choices left. In those cases, we can apologize for ending up there. Later, we can think through what happened and try to come up with other options for next time. If we notice this seems to be happening regularly, that’s a good clue that we need to try change something up. Try different things and see what happens. All the while we’re learning what does and doesn’t work and the child is gaining experience with the situation—and getting older. She won’t be 18 months old forever. I think this might be the crux of your challenge. Unschooling isn’t about “do whatever they want.” It’s dependent on the situation. So, choosing shorts and t-shirt for an inside day makes sense. Not wearing winter boots when you’re going out to play in 12 inches of snow does not make sense. I don’t see a contradiction. So it may be in the way you’re thinking about things and talking with your children. I don’t think I’ve ever said, “do whatever you want.” That seems like I don’t care what they do. I do. I may have said, “What would you like to wear today?” Leaving it open-ended if it truly didn’t matter. Maybe it was, “We might bring out the paints today, so why don’t we find an old t-shirt for you to wear?” More often, I think, I just put some clothes on them when they were young because they didn’t much care, they were too busy playing. Bring the circumstances into the conversations so that things don’t seem so arbitrary. So that different clothes on different days don’t feel like a contradiction. Same with your son and saying “yes” or “no” to his requests—explain the reason behind your answer so that it doesn’t feel arbitrary and “out of control” to him. Conversations. Connections. The parenting shift away from us vs them means being on the same team. We share our experience, yet we don’t expect them to come to the same conclusions as we do—they aren’t the same person we are. They do their own learning. And we bring ourselves to our days. We are cognizant of our own needs, yet we value their needs as much as our own—and we recognize that young ones have lots of physical needs. From there, we try to weave our days together to meet everyone’s needs and wishes as best we can. Many—most—days aren’t perfect, but they’re honest. Wishing you and your family all the best as you dive into your unschooling days!